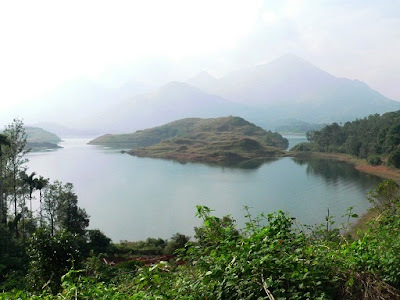 Banasura Sagar Dam (Open 10AM to 4PM) is around 45KM from Sultan Battery. It is named after Banasura, the son of Mahabaili. To get there, on Calicut Road take the Kalpetta Byepasse to the Left and from the Byepasse junction take a Left for 1KM towards the town and Left again at Chemmannur Jewelers. From that point, it is about 20KM to the site. 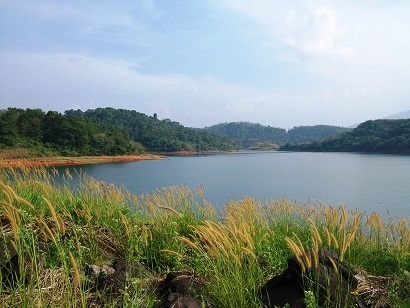 The last few kilometers of the route is very scenic with nice views of the reservoir at several spots - the dam is on the Karamanathodu tributary of the Kabini river and a set of islands were formed when the reservoir submerged the surrounding valleys - The vast area surrounded with water and the islands along with the Banasura Hills make for a spectacular site. 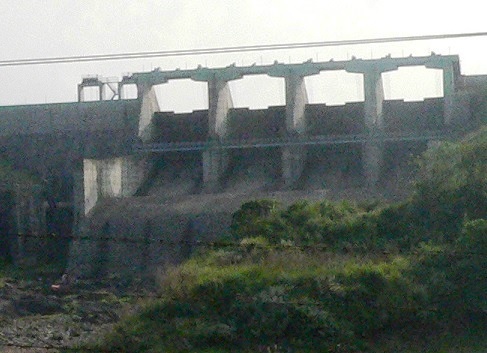 Tourism at Banasura Sagar Dam is co-ordinated by Kerala Hydel Tourism Centre, the tourist facilitation centre of Kerala State Electricity Board (KSEB). They do a pretty good job and ticket pricing is very reasonable (Rs 20 and Rs 25 for camera). Access to the actual dam itself is cordoned-off due to security reasons - a nice garden by the side and the boat launching site is what is on offer to the general public. To access the area, there is a short walk from the ticket counter around KSEB residential lots and a short hike up to the site. There is stunning scenary on offer here but the actual dam location is not visible - the best place for that is on the way in, a kilometer or so before reaching the ticket couter. It is the largest earth dam (made up of massive boulders) in India and the 2nd largest in Asia. Activities available include pony rides, kid’s play areas at the park, boating, and a couple of exhibitions (philately & numismatics and horticulture - very modest - philately/numismatic museum has Kannur philately club president’s collection - nothing special but still interesting). It is also feasible to go trekking at the Banasura Hills. Meenmutty Falls (a different one than the one with the same name off Vaduvanchal-Ooty Road) is around 5KM from the site as well. Kuruva Island is about 33KM from Banasura Sagar Dam. The route is via Padinhara Thara, Kellur, and Kappunchal. The island is reached via a bamboo ferry from the banks of the Kabini River. There are two ferry locations one on either side of the river bank. The direction markers to the site can be confusing at some points as it does not clearly indicate the correct ferry location. The nearest one when coming from Banasura Sagar Dam is termed locally as Mananthavady-side ferry while the ferry on the other side is termed Pallipudi. On the Mananthavady-side, the roads in the final15KM stretch are narrow but generally OK - there are stretches with potholes and the final kilometer is through a gravel road with a concrete path. The ticket counter is open from 8AM to 3:30PM. Tickets are Rs 80pp and Camera & Parking are an additional Rs 50 each. There is a short walk leading up to the ferry launching site. Your bags are checked and plastics are tagged with a Rs 20/- deposit. The bamboo ferry is manual - there are ropes across the banks of the river and the ferry is moved by pulling the ropes thus pushing the ferry forward - fascinating and technique is more important the raw power to get the job done - on our way back, we were the only ones in the ferry and the driver allowed us to have a go! 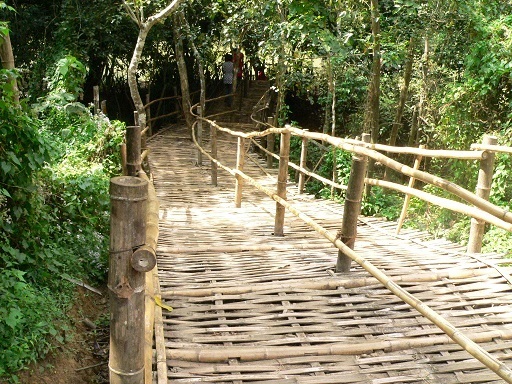 The forest department has constructed a pathway of around 800 meters that gets you to the other side of the island. A rocky spot in the river on that site is designated for people who want to get in the water. The area is very popular and pretty crowded most of the day. The water is reasonably clean, shallow, and safe in the designated areas but people have lost lives in other parts of the same river. Animals are aplenty in the islands in the Kabini river and it is not unusual for elephants to roam in as well. 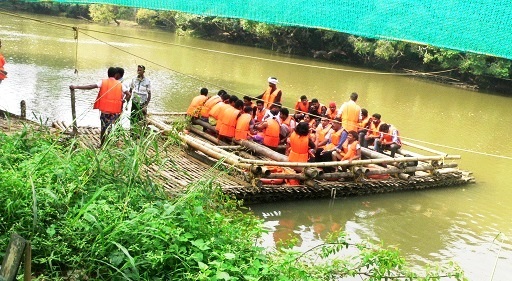 At the Kuruva Island, it is however very rare to see any animals at all, as the place is always crowded with tourists. Pazhassi Raja Tomb is in Mananthavadi Town - by following direction markers (~18KM) and then it is up District Hospital Road (there is a three-way road and this is the middle one) a short distance to the entry gate - there is limited parking inside. 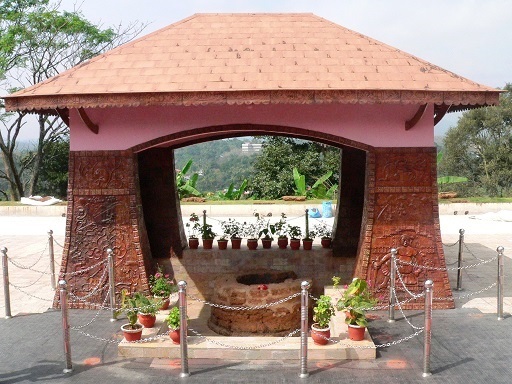 The Pazhassikuteeram Project Museum site was recently renovated with funding of Rs 10L by the Kerala Department of Archaeology. Tickets are Rs 10/- and Camera is Rs 25/- (camera not permitted inside the museum). 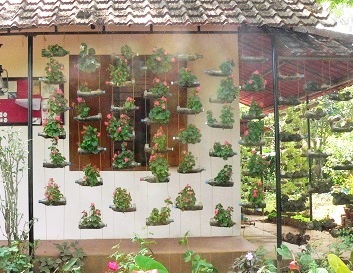 The museum has Pazhassi-era artefacts from the area. Wayanad - Edakkal Caves, Ambalavayal Heritage Museum, and Soochipara & Meenmutty Falls - Review. Wayanad - Lakkidi Viewpoint, Pookode Lake, & Sultan Battery Jain Temple - Review. Wayanad - Muthanga Wild Life Sanctuary Safari & Chembra Peak - Review. Wayanad - Banasura Sagar Dam, Kuruva Island, & Pazhassi Tomb - Review (this post).